Every knows Da Vinci as a man of great artistic skill and ingenious invention, but he wasn't just about that. IGT drew inspiration from the fact that he also loved highly valuable and extravagant items that showed off his class. Thus, the diamonds and the other many gems that adorn this beautiful slot, and with tumbling reels and plenty of extra spins to be had, this Da Vinci Diamonds slot review will explain why you must play this great game. IGT is a software developer that creates hit after hit and there is no way of stopping them. Just think about it – Pixies of the Forest, Cleopatra, Golden Goddess and many more famous and hugely popular classics were crafted by IGT. So, it comes as little surprise that Da Vinci Diamonds is also high up there with some of the most played slots of all times and for all good reasons. Read on to find out more about its gameplay, winning potential and features. Of course it was necessary to make a reference to the famous Mona Lisa painting, one of the best known works of Da Vinci himself. But IGT have done not a much worse job when it came to designing the Da Vinci Diamonds slot, as the graphics are visually appealing. Yes, there is that ‘rustic charm' about the slot that is ubiquitous to all IGT slots, but that doesn't take away from the gaming experience. Set in a beautifully crafted golden frame, adorned with gems and carvings of all shapes, colours and sizes, playing the Da Vinci Diamonds slot seems like a luxury experience. The attention to detail is impeccable and the players will take great pleasure in the symbols that are vibrant yet fit into the theme smoothly – Amber, Ruby and Jade all adorn the reels, as does the Mona Lisa, Da Vinci himself, Lady with an Ermine painting and the slot logo too. There is no clutter and there aren't too many graphics or sharp sounds that could distract you from the slot. Add to that music of elegance and beauty that was Renaissance and there is little wonder that IGT decided to take this (originally) offline slot and submerge it into the world of online and mobile gambling. 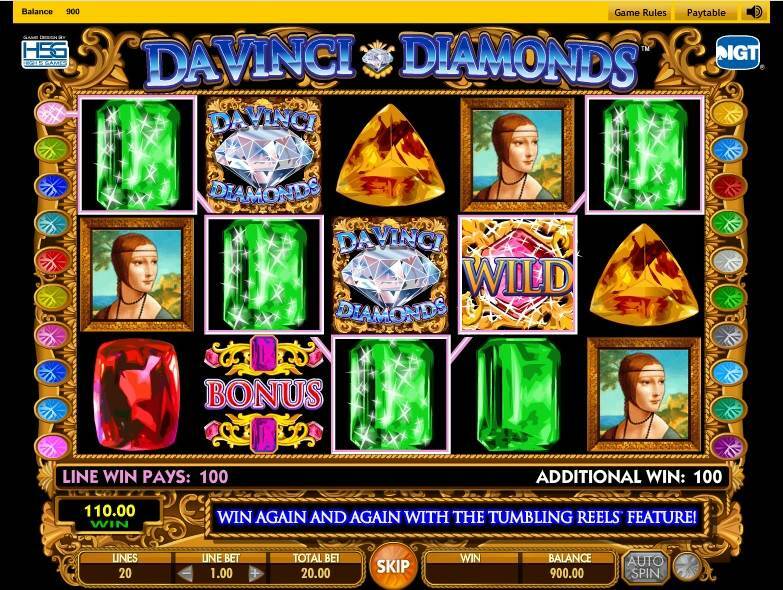 If you like the other classic IGT slots, then you will surely like Da Vinci Diamonds too. In many ways, it's a simple five reel slot that has stood the test of time for a great reason – it offers a magnificent winning potential and that's the major lure for the players. The twenty paylines do their job beautifully to bring you big, huge and mega wins too! Although we will talk more about the Avalanche Reels feature below, it's worthwhile mentioning that this really does compound your wins, and although there is no multiplier to it like the Gonzo's Quest Avalanche Reels, it still means that you can bet just once and reap multiple winning combo payouts. The wagers range from 20p to a maximum bet of £200 and you can win the jackpot of 5,000 your wager if you mange to hit five Da Vinci Diamonds symbols on the reels. We'll do the math for you – that's £1,000,000 maximum payout. Say what! Lastly, although the slot is low variance, as you can tell it can churn out massive wins. Alright, maybe we throw around the word ‘massive' quite often, but this time we really mean it – how can a million pounds not be considered massive? Yup, it can't! We can't remember any other slot with such winning potential that was released recently, making Da Vinci Diamonds a unique mobile slot not only in it's irreplaceable theme but also the sums of money it dishes out to lucky players. First up, the Tumbling Reels – as we already briefly touched upon, are pretty simple. If you're familiar with this feature on other slots, then you definitely won't need much explaining – when you get a winning combo, the symbols that made it up will shake, rattle and disappear. Then, other symbols will appear, possibly triggering more wins without you ever staking another bet! So, it's the one bet that keeps on giving; you can think of it as a mini-extra spin, but there are real Extra Spins too. Three Bonus symbols is all you need to get 6 extra spins awarded to you, with more extra spins added when you get four, five or more Bonus symbols on the reels. Plus, Extra Spins can be re-triggered during a extra spins round, all of which combines to a total maximum of 300 extra spins. Insanity! And lastly, the humble Wilds. As in every other game, these can substitute for all other symbols except the bonus one, so you can maximize the winning combinations that you get. Want to play Da Vinci Diamonds? Da Vinci Diamonds Sometimes a mobile slot can have too many features, gameplay gimmicks and flashing lights. That is not the case with IGT's Da Vinci Diamonds. Despite the luxurious and lavish theme of gems and Renaissance paintings worth millions upon millions, the gameplay is as simple as it can get - the focus is all on hitting winning paylines and raking in as much cash as possible. Things are further simplified by the fact that there are one just a handful of real features in Da Vinci Diamonds, which are the Extra Spins and the Wilds. Both have great potential to multiply your wins, as do the Avalanche Reels which can easily take a small wager and give it a massive return on investment. That said, we try to look past the fact that the house edge on this slot is a sizable 5%, but with the slot being of low variance and with wagers starting at just 20p, we think that Da Vinci Diamonds is an excellent proposition both for those looking to pass the time and for those who hope to get their hands on a lofty one million pounds maximum payout if they are willing to take the risk. We love the old school vibe to the slot too, and although this might not be to everyone's taste, Da Vinci Diamonds slot proves that once a classic, it will always remain a classic. And a hugely popular one too! Four out of five stars. NextBest Christmas Mobile Slots To Spin This Festive Season!